As a newly-professed religious brother, Islander’s sibling, K, had to go to France to learn about the 200-year history of his congregation and its founder. Along with his fellow brothers and sisters from all over the world, they met in Bordeaux for an ongoing program of formation to learn about their roles as young missionaries. They were also fortunate to have made a pilgrimage to nearby Lourdes, the hometown of St. Bernadette, who had incredible visions of Mary, the Immaculate Conception, in 1858. St. Bernadette’s life story, apparitions and journey to sainthood have been chronicled elsewhere so we are not elaborating here. However, we are providing a peasant’s recipe from the Midi-Pyrénées region where she grew up as a poor girl. 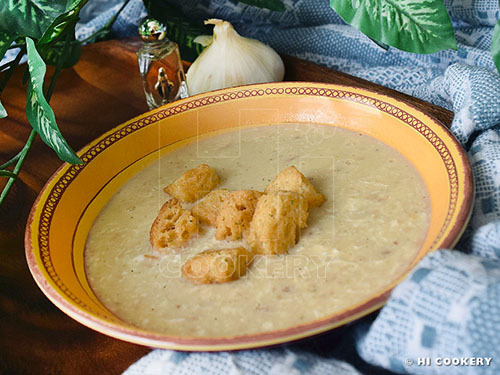 Tourin is a French-style soup made of sautéed garlic thickened with a little flour and egg. It is very flavorful for those who love garlic like we do! So celebrate with simple soup on the Feast Day of St. Bernadette of Lourdes today or on April 16. Slice the garlic cloves thinly. 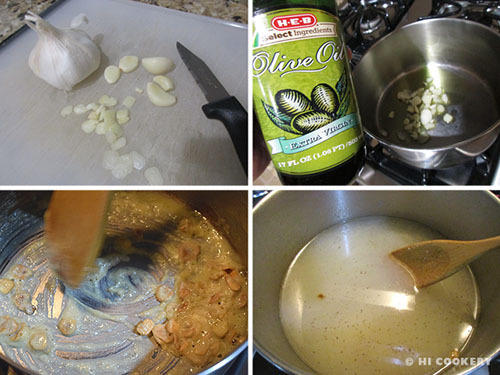 In a small soup pot, sauté in olive oil over medium low heat until brown (about 5 minutes). Stir in the flour quickly to make a roux. Slowly pour water while constantly stirring and dissolving any clumps of flour. Boil on medium low heat for 20 minutes for the garlic flavor to develop. Season with salt and pepper. Meanwhile, separate the white and yolk of the egg. 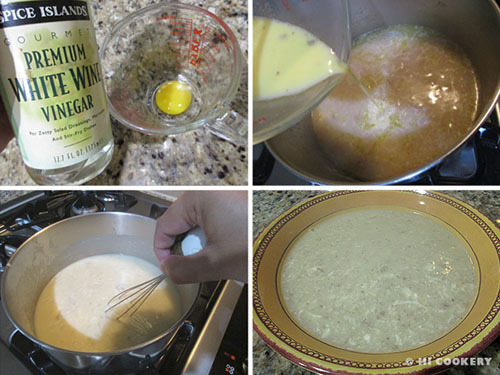 Mix the vinegar with the egg yolk and 2 tablespoons of the boiling soup water. Pour this mixture back into the pot. Stir well. Whisk in the egg white quickly. Allow the soup to thicken for another 5 minutes. Ladle into soup bowls. Garnish with croutons. Serve hot. Yield: 2 servings. February 18 is when the locals in Lourdes and traditional congregations in France observe the Feast Day of St. Bernadette. Others celebrate on April 16, the date of her death in 1879. Thanks to Islander’s brother who brought back a bottle of Lourdes water from the grotto’s spring as a souvenir. It is pictured in the final food photo above next to the garlic bulb. Learn more about Lourdes water, St. Bernadette, Our Lady of the Immaculate Conception and the place for pilgrimages from the Sanctuaire Notre-Dame de Lourdes website.